Royal Ascot is one of the social calendar events of the summer season that we at Suzannah really look forward to. Our dresses really suit the occasion. Probably because we love it so much. Fine fashion and fast racing! Ladies love to dress up and really have fun with their complete look at this event. A slightly more free, and fun way of dressing than for a wedding. A glamorous day to let your hair down. Place some bets, have fun! A really great British day out! 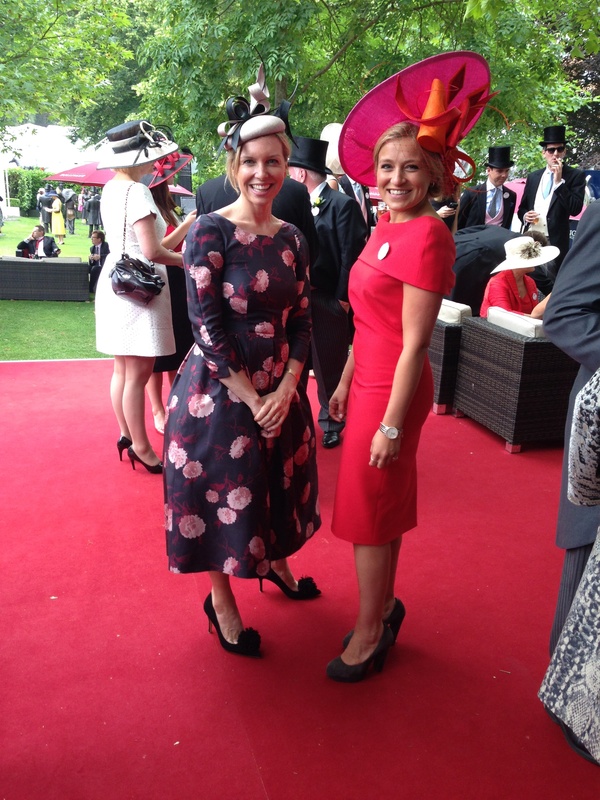 I was thrilled Princess Beatrice wore one of my dresses on day 1 of Royal Ascot. A heart melting moment when the carriages arrived. H.R.H Princess Beatrice also wore Sarah Cant millinery. Here is a link to Hello magazine were H.R.H Princess Beatrice was voted their best dress of the day one. On day two my wonderful couture client Belinda Strudwick. Belinda who is a racehorse owner and trainer attends Royal Ascot each year. We worked on a glamorous eye-catching outfits for her. I felt it was really important to dress in red as it is a key fashion relevant colour, and a colour in which she absolutely shines in. She was photographed wearing her Suzannah 50s Century Gazar dress in Poppy red and an enormously grand upward saucer coordinated with Edwina Ibbotson. She was photographed many times and along with Gok Wan’s vote for dress of the day, she was also pictured in the Times and the Daily Telegraph. I was lucky enough to go to Ascot for ladies day. The sun was shining! I started my day at Beauty Rose on New Quebec street, just opposite my boutique. Knowing I was to be interviewed by Channel 4 with Gok Wan, I needed to pay attention to my complete look. Robert created a classic english twist up-do in my very brief visit to the salon which he kindly opened an hour early for me! It was fantastic. Not too perfect and polished. Modern and a little bit casual! I had never visited the salon before but have heard great things from my clients about Shaun, Joe and Robert and the skill they have as a hairdressing team. I had chosen an Edwina Ibbotson piece of millinery. Edwina is my couture milliner who I collaborate with. She has ultimate principals. Her quality and design are impeccable. I love her pieces as they have a clean, modern appeal with a certain something! they feel and look every bit the couture piece, and work with my handwriting beautifully. The millinery was loosely matched to my dress. I hate to match too much, and prefer a nod to the palette. 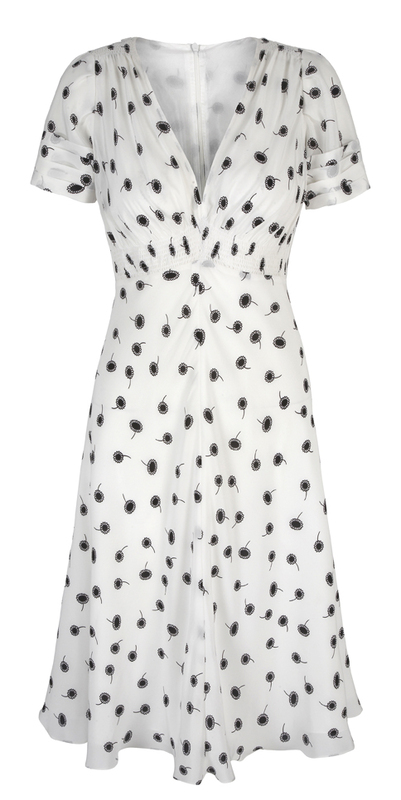 I chose a 1950s inspired printed midi dress called the Bloom Dancehall, which is from my pre-fall collection. The dress is demure, and beautifully fitted. I felt it represented me well. I wanted to look elegant and composed and together and as good at 14.40 ( my tv slot), as when I left my boutique in the morning 9am. It stood the test of time. No creases! I wore Emmy, Suzannah pompom shoes. Divine. When I arrived at Ascot I was hit by the array of colour this year. Lots of bright, fun colours among charming pink and peachy hued neutrals. Amazing. Some really really lovely considered outfits. I was first interviewed by Martha Ward of Vogue. She was representing Ascot TV. I had a trial run!. Live! very scary but great fun. Martha always looks so elegant. She was wearing Amanda Wakely. 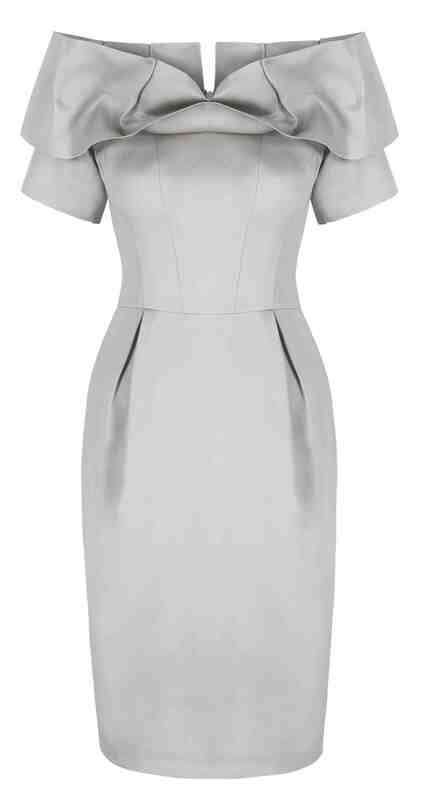 I loved the combination of neutral with metallic, and on a simply blocked elegant shift dress. I really am drawn, and really do love simple clean lines, and simple elegance. I find it the most powerful statement. Martha completed her look with elegant modern high slick gold sandals and a warm cream pill box. Within the morning I bumped into the fashion and lifestyle blogger Liberty London Girl. We had dressed her for both of her days to Ascot. She has the most wonderful voluptuous curves and looks sensational in 40’s and 50’s inspired silhouettes, really enhancing her best assets. On Day One of Royal Ascot she chose to wear the Princess Coat Dress in Navy Blue, and on Ladies Day she opted for the silk tie front tea dress. It was really important for Sasha ( LLG) to look as immaculate at the beginning as the end of the day. Her comments were that the dresses always make her feel like the very best version of her! what better compliment can a designer receive. 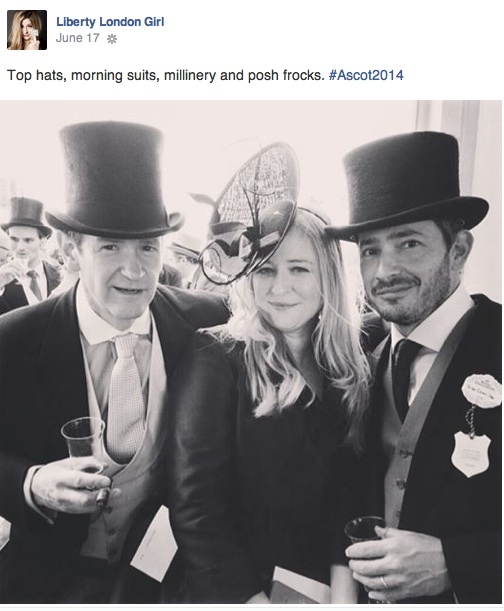 She is photographed here with Alexander Armstrong and Giles Cohen. A fabulous photo. With two handsome men in silk top hats! A bride in green should so be seen! Absolutely thrilled to have been selected to appear on Ch4 during the Royal Ascot week’s television coverage alongside Gok Wan. Several high profile designers known for their Ascot relevant design, and high profile milliners were featured during the week: Stewart Parvin, Philip Treacy, Rachel Trevor-Morgan, Jane Taylor and Caroline Charles. I was featured as one of the newer designers on the scene, and luckily my clippit of film both pre-recorded on live were shown on Ladies day, Thursday 19th June 2014. Below is an image of myself and Hetty Chedwick just before the filming. Hetty, the luxury editor of Country Life magazine worked with me as a great muse to create the perfect Ascot look. Hetty wore the ready-to-wear Cape shift. We adapted Hetty’s dress with simple alterations. As Hetty is a size 10 with a petite height of 5ft 3″ ( without hat!) We lifted the dress at the shoulders as she is a little shorter than average, replacing the collar piece and raised the hemline by 3cm. Hetty’s wonderful millinery was created by Couture milliner Edwina Ibbotson, who I collaborate with to create special event showpiece millinery and pieces of extreme standard. We decided this wonderful upward brim saucer in colour blocks of red, pink and orange would bring a fabulous energy and fun to this chic outfit whilst being complimentary colours to Hetty’s complexion. The clean sculptural lines of the dress and the hat work well and translated the look giving the drama necessary for Ascot and the Royal Enclosure Ascot and not wedding. I wore the new Bloom Dancehall midi silk dress from the pre-fall collection with netted underskirts and Emmy suede pom pom Suzannah heels, again with Edwina Ibbotson couture millinery. I opted to not be too matchy, but to work within the palette of tones within my outfit. We both felt great and confident, and with our filming mid-afternoon were delighted the dresses stood upto our important test of time for looking immaculate after we had been wearing them for a long journey there and all day! Best dressed in Red. 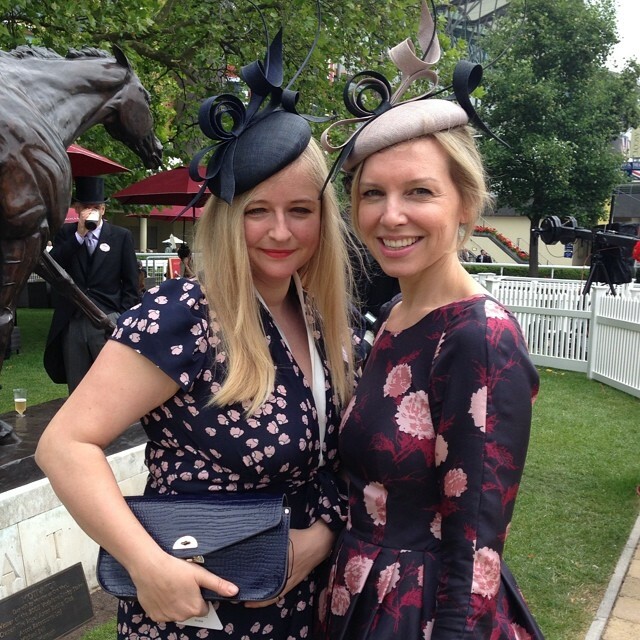 Our Couture client Belinda Strudwick wins best dressed wearing Suzannah on day two of Royal Ascot. Our stunning client Belinda Strudwick, wins best dressed on day two of Royal Ascot, as voted for by Royal Ascot fashion correspondent and presenter, Gok Wan. Belinda wore the Century dress in red, styled with couture millinery by Edwina Ibbotson, as featured in The Times. 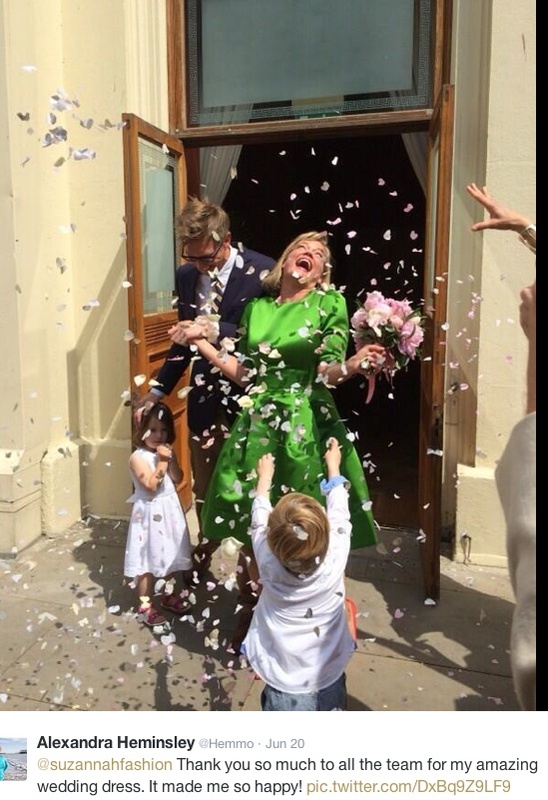 Jodie Kidd wears the Suzannah Princess Coat with Petal-A-line dress with Philip Treacy millinery. A chic ensemble chosen by Jodie who is the ambassador of this Derby. Outfit worn on Saturday 7th June 2014.